Montessori is method of education for improving individual skills and interests within the child, in accordance with specifications of individual learning pace and character is basically explain in pedagogy theory. Montessori training focuses on the formation of personality. Maria Montessori, it is clearly stated as follows : "The method of education, merely should be considered in the human personality and education thought to the child must ensure a strong character building". Balance sense of physical and mental hygiene is actually needed. In this case, the task of adults in the child's ability and awaken them to the secret power of the method development process must be supported. For Montessori methods it should give the freedom for the kids or toddlers when they want to do something, they can choose the toys, the condition or even the place they want to try some activities. 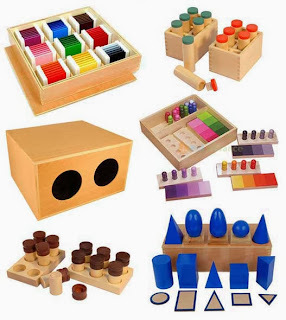 Montessori method thus extracted , to develop a self- motion around the child and a prepackaged freedom of activity aimed at recognizing , self-forming and developing a method and system approach. That is exactly the point of home schooling, when child or toddlers want to do something, let them choose, and make their playing and let them to try to adapt new values for their character building. Doing play games for fun and positive values gain! Home Schooling an Montessori Education Approach Is original article written, if you find that Home Schooling an Montessori Education Approach is violating DMCA please don't hesistate to contact me http://edutoddler.blogspot.com/2013/10/home-schooling-montessori-education.html, and Thank For Visit Early Learning Methods for Child and Toddler. Blog baru ya gan ?? iya gan...seandainya ada blog agan yang se tema lebih bagus.